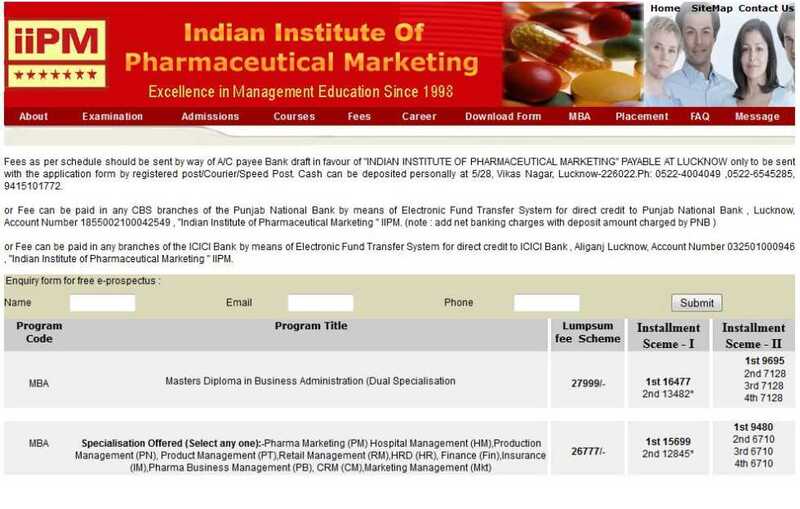 Give me some information about Indian Institute of Pharmaceutical Marketing (IIPM) - Uttar Pradesh, Lucknow? Indian Institute of Pharmaceutical Marketing (IIPM) was established by Sapt Rishi Society for Social & Educational Development. Kanwal Meet Singh Amsons Medicine Co.
Shaitendra Kumar Srivastava Ralson Remedies Pvt. Ltd.
Patel Gunjan Chandravadan Preet Pharma Pvt. Ltd.
Shyam Singh Chauhan Fulford India Ltd.
Gopal Cheetry Service in Assam Govt. Sachin Sharad Purohit Resilient Consmeceuticals Pvt. Ltd.
Manoj Mehta Emcure Pharmaceutical Ltd.
Shah Tushar Ramesh Bhai Wyeth Lederlf Ltd.
Pushpander Kumar P	arentral Drugs (I) Ltd.
Judhajit Tarafder Sarabhai Piramal Pharmacuetical (P)Ltd.
Salahuddin. MD Khandelwal Laboratories Ltd.
Shubhi Singh BAL Pharma Ltd.
Sumnata Mukharjee Ordain Health Care Pvt. Ltd.
Kiren Barori Warren Pharmaceutical Ltd.
Sarothi Roy Alkem Laboratories Ltd.
Nishith Haresh Pathak Gujarat Themis Biosyn Ltd.
Mahesh C. Gokhale Cadila Healthcare Ltd.
Pandya Kirit Jayshankar Strides Arcolab Limited. Annapuredy Sanjia Reddy Dr. Reddy's Laboratories Ltd.
Pradip Kumar Deb Nath Cipla Ltd.
Thangaraman R Comed Laboratories Ltd.
Shahid V. Khan Tonira Pharma Ltd.
Devendra Singh Citadel Aurobindo Biotch Ltd.
Paul K.K. Intas Pharmaceuticals Ltd.
Thiya Prakash Vasudev Intas Pharmaceuticals Ltd.
Akhileshwar Nath Pandey IPSA Labs (P) Ltd.
Nitin Kulkarni Vimta Labs, Hyderabad. Bhola Nath Rastogi Dr. Reddy's Laboratories Ltd.
N. Deivasigamani Tablet (I) Ltd.
Arnav Chakraborty Stiefel India Pvt. Ltd.
Vinayaka G. Shreya Life Science Pvt. Ltd.
K. Lakshmi Narayana Sudershan Laboratories Ltd.
Veereshwar Rao Dinavahi Sudershan Laboratories Ltd.
Miss Hazel Fernandes Novartis Consumer Health India Pvt. Ltd.
Sukanta Deb Elder Pharmaceutical Ltd.
Sateesha P Padsalgi Sunligh Marketing & Services (P) Ltd.
Gyanendra Pandey MG Pharma, Marketing Agents for USU Ltd.
Rajeev Srivastava Edison Drug House. Lokesh Kumar Sharma Shrey Nutraceuticals & Herbals Pvt. Ltd.
V.G. Saravananan	Ranbaxy Lab Ltd.
Sachindra Kumar Jha	Dabur Pharma Ltd.
Vihsal Khare Mercury Labs, Ltd. Baroda. Ashish Kumar Sarathe	FDC Limited. Vikas Joshi Elder Pharmaceuticals Ltd.
Naveen Agrawal Sun Pharmaceutical India Ltd.
H K Sharma Glenmark Pharmaceuticals Ltd.
Sunil M. Pandya Tonira Pharma Ltd.
Sham G Lal Cadila Healthcare Ltd.
Amit Saxena Mankind Pharma Pvt. Ltd.
Venu Pushkar Jagsonpal Pharmaceutical Ltd.
Tapan Saxena Mankind Pharma Pvt. Ltd.
Basant Lal Maurya	Franklin Laboratories India Pvt. ltd.
Rabi Ranjan Colgate Pamolive (I) Limited. Vikas Chandra Sheel	Mankind Pharma Pvt. Ltd.
Kapil Kohli Zivon Marketing Services Pvt. Ltd.
Sushil Kumar Sharma Apex Laboretories Ltd.
Agnimitra Sinha Cadila Healthcare Ltd.
Parimal Pratap Arjugade Torrent Pharmaceuticals Ltd.
Harish Pal Biomedicare (I) Pvt. Ltd.
Pawan Kumar Verma Bestochem Formulation (I) Ltd.
Dr. Varun Katyal Lambda Therapeutic Research Ltd.
Indian Institute of Pharmaceutical Marketing (IIPM) was founded in 1998. 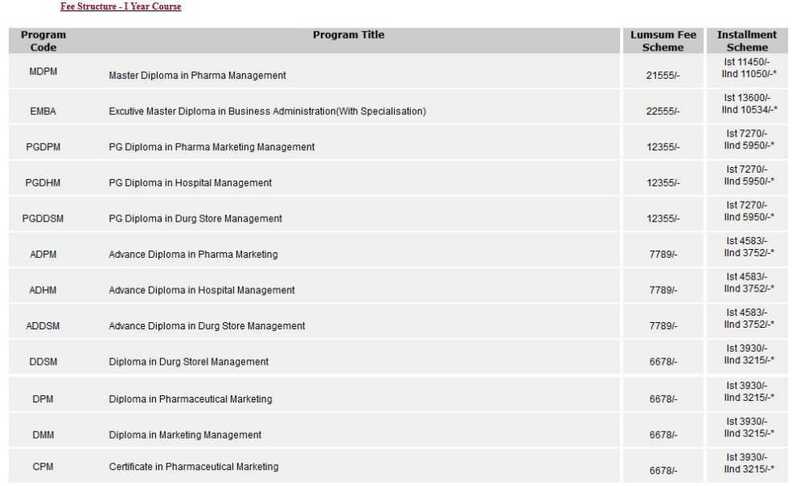 The Indian Institute of Pharmaceutical Marketing is approved by UGC, AICTE and DEC. The IIPM is certified with ISO 9001:2008. The college is offering the master degree, Diploma, Post Graduate Diploma, Advanced Diploma and Certificate courses in Management. For admission in IIPM, applicants need to send the duly filled application form with required documents at college and application Fee. Placements: IIPM Students got good placement in companies. Following are the companies in which students are placed.